This page is written by the game's inventor, V. Reinhart. "Chess on an Infinite Plane" is a chess variant played on a chessboard of infinite size. Additional pieces are included in the starting position not just for variety, but to help make enough material available in the endgame so that one player can force a win. Since there are no borders, pieces (in particular the king) cannot be trapped at the edges or in corners. The chancellors (R + N) provide immediate ability to create long distance attacks. Additional pawns, some in rearward formations (called jÃ¤ger units) can enter into play and create threats of additional promoted pieces. The rearmost pawns are protected by hawks. Each player also has two guards, which can be used as king defenders, or for other strategic play. AÂ red bracket indicates the a1 (1,1) square. Chancellor(C): Moves and captures as a rook + knight. Guard(G): Moves and captures the same as a king but is not affected by check. Hawk(H): Leaps exactly 2 or 3 squares in any orthogonal or diagonal direction. The leaping move means it can jump over other pieces. Pawns play the same and promote at the same rank as in classical chess. White pawnsÂ promote at rank 8, andÂ blackÂ pawns promote at rank 1. Pawns can promote to chancellor, hawk, or guard in addition to queen, rook, bishop, or knight. Pawns may capture and be captured en passant with the same rules as in classical chess. There is no fifty-move rule. Draws can only occur from stalemate, threefold repetition, agreement, or a proven case of insufficient material to force checkmate. All other rules are the same as in classical (FIDE) chess. A playing area should be setup with at least 22 ranks and 20 files. Ensure provisions are available to expand the board ifÂ play requires. If this becomes inconvenient due to far-away pieces, a display board is used to indicate the location of remote pieces. If there is interesting play in small but remote areas, other playing areas can be labeled and used separately from the main board. A chess diagram is used to indicate the position of pieces either after each move by white, or each move by black. The diagramÂ should include 22 ranks and 20 files. If any pieces are moved outside of this area, the diagram is expanded or notes are shared to indicate the location of far-away pieces.Â If there is interesting play in small but remote areas, other diagrams can be used to show piece positions separately from the main diagram. Numeric coordinates are used to identify piece locations asÂ (file#, rank#). The "a1" square is (1,1) and is marked on the chess diagram with a small red bracket. Increasing files are to the right, and increasing ranks are toward theÂ back. 1) Trappist-1 - Adds the huygens chess piece. The huygens leaps 5, 7, 11, 13, and all larger prime numbers of squares in orthogonal directions. They are initially located to protect one of the pawns in the jÃ¤ger units, thus, making it safer for the hawks to leave their positions and join other battles. (as a side effect, the huygens may ensure that this variant of chess will never be "solved" by computers, as the complete set of prime numbers is itself unknown). 2) Formation Chess/Infinite Plane - Each player starts with a large number of knight (usually twelve or more). The knights can join into 2x2 formations, gaining the ability to move together as a queen. The group must stop moving when at least one of the members encounters an occupied square. A group can capture an opponentâ€™s piece, but only one and not more than one per move. If the group falls apart, or one member is captured, the remainder play again as knights. (A hybrid game by EvertVB and Vickalan). Yes, that will obviously make it "more infinite". Still the kings are the point of atraction. But if you make more kings then you have two cases. 1. You have to mate one king to win. Which after a finite number of moves will often degrade in the previous situations as one king will become more vulnarable although each side could need to use plenty of moves for the defence of it's wekest king. And surellyanother win condition would be to simultanioulsy check 2 kings with an unattacked piece. Also winning. So 2 and in extremme conditions even 3 enemy kings could get involved but it is not a big difference in the end. 2. You have to mate all (which is probably a countable infinity, maybe the ordinal omega0). That is a whole other devil I don't know how to aproach yet. You may also make different winning conditions like capture the flag, like bringing a piece to a certain area of the board withouht beeing caputed at the next turn. Also you may make a condition to clear a certain area of enemy pieces. So there is a whole world of possibilities out there. @Aurelian, that is a really interesting comment, and I love that idea. Like you say, an unbounded board can be populated with an infinite number of pieces in many ways. In addition to what you mention, and "on top" of the "normal" armies (near the kings), pawns can be populated for example on every 10th file and every 10th rank. So the density in half the plane is 1/10 x 1/10 = 1%. Similarly bishops and rooks can be populated with a density such as 0.1%, and queens populated on 0.05%. So now you really have an "infinite" game with "infinitely many" pieces. But still - only one king of each color. 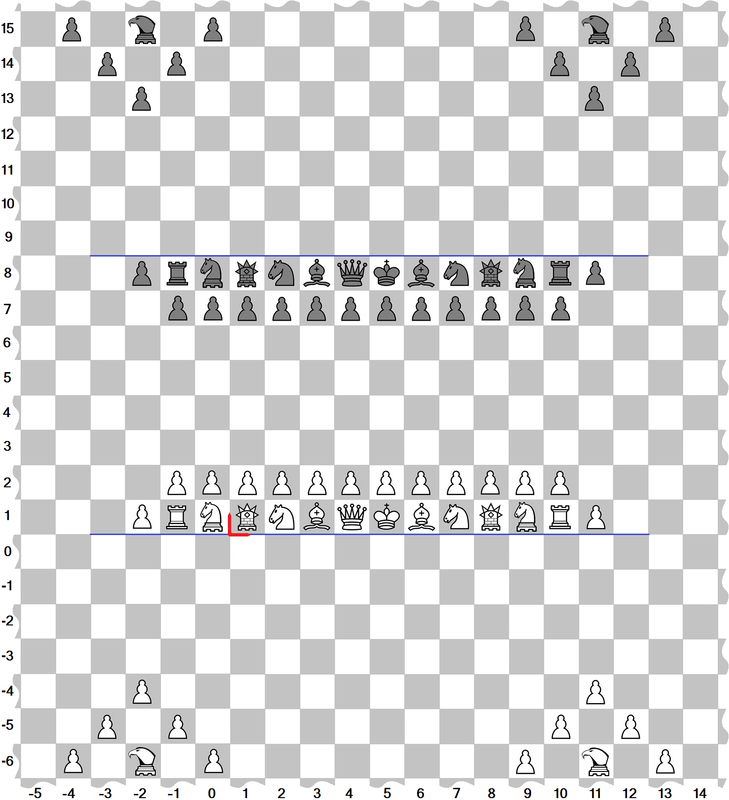 As in the diagram, the White king starts on (5,1) and the Black king starts on (5,8). This could have amazing and very interesting mathematical properties. Obviously, the strategy of the end-game cannot be "simplification" to just a few pieces! Players will need to learn to mate as other pieces slowly march inward, trying to replenish captured pieces. Who is going to solve this type of game strategy? You said it best: "But we as cyborgs of the future will get there". I agree with you 100%!!! In the comments section of chess with different armies Vickalan Reinhart (the author of CoaIP) stated " As far as I know, there is no upper bounds for the maximum size of a good board size, and even infinitelly-large boards are easily playable and fun. " I think the remark I am going to make is more appropriate here. I just wanted to make the remark that the term "on an infinite plane" is appropriate as the game is not that infinite after all. It has a decent number of pieces and the effect of board largeness fades away far. It would be more "infinite" if maybe players would have pieces according to some rules all over the board (with an 50% density maybe). For example white would have a knight on all white squares on even files, and black would have a knight on all black squares on odd files. That would be quite silly (almost all knights are undefended and attacked), but with work one can make more complex rules for more pieces. From a mathematical point of view these games would be quite interesting but as of 2018 we don't have the technology or not even knowledge to tackle such complex problems :)! But we as cyborgs of the future will get there. Mark my words :)! I did update the images to the CVP site, and updated the links. It looks fine now. This same game was also released with Fergus' abstract icons, but I'd like to show the game with both pieces sets. The game is already being played with the classic icons (this submission), and some people might prefer this style because it looks much more similar to the normal chess pieces. Images seem to be broken. You can upload images to this site (see the text near the bottom of the page), fixing any issues with Flickr. Oh, but you resubmitted with new images. I've kept this one hidden in favor of that one. They are the same game, just with different images, right?